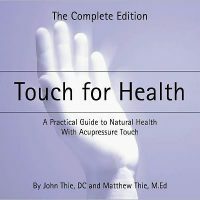 This has all the information of the Touch for Health Reference Chart plus more charts. 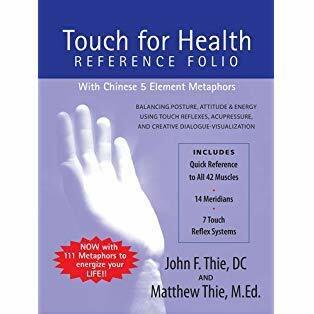 It is 12 x 9 inches and the page for each meridian shows all the muscles for that meridian, their locations, and all the reflex points and nutritional suggestions for restoring the energy flows.This has all the information of the Touch for Health Reference Chart plus more charts. 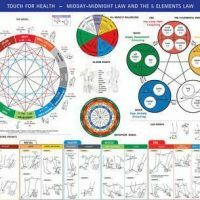 It is 12 x 9 inches and the page for each meridian shows all the muscles for that meridian, their locations, and all the reflex points and nutritional suggestions for restoring the energy flows. 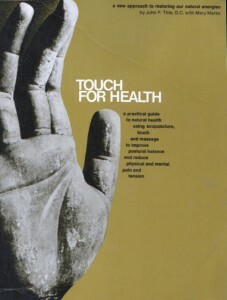 It can be used where space for a wall chart is not available. It is easy to read and has the pages marked so that tabs can be cut to facilitate finding the meridian page or other material easily and quickly. For any therapist making house, hospital, or business calls to do balancing this folio is a must. For the lay person getting help from a family member or friend this folio can be most useful in the home where there is not room for charts on the wall.